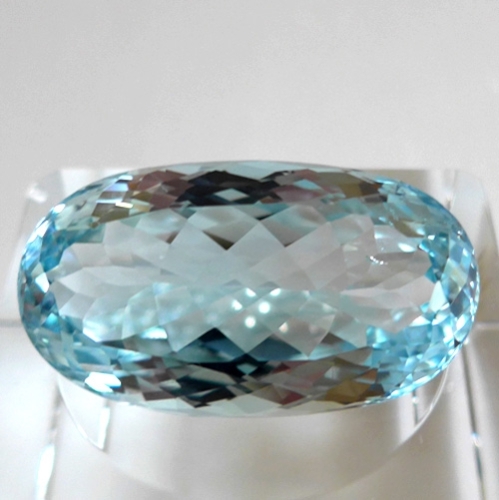 Dimensions (HxWxD): 1.5" x 0.875" x 0.625"
This rare, gorgeous, natural, untreated, unheated oval-shaped, highly faceted Brazilian Blue Topaz gemstone, weighing 106.5 carats, comes from the province of Rondonia, in Northwest Brazil. We obtained this beauty from a mine owning family in Brazil we have known for years, and we are certain that it is indeed all natural and untreated. 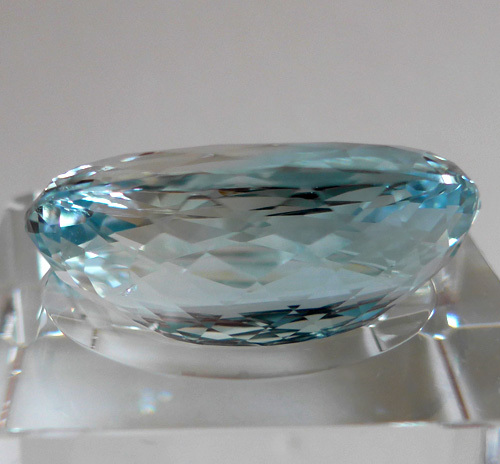 The color alone is evidence of its authenticity, since heat treated blue topaz is a very different darker blue. This gemstone measures 1.5 inches by .875 inch wide and .625 inches deep, so the stone has enough depth to generate substantial bling. There is a tiny pinprick interior inclusion in this gorgeous gemstone which comes nowhere near the surface of the stone. Blue Topaz is a rare find indeed, and resonates with the energy of the throat chakra, which is associated with the color blue in the Western chakra system. Blue Topaz assists us in speaking our own truth, in a way that is easily understood by others, and thus is indicated for those working in theater, electronic media, and other activities requiring good communications skills. Blue Topaz also helps us to manifest our own inner truth, our Higher Purpose, all those goals and desires which align with our own best and highest good and which promote the achivement of the best and highest good of all those with whom we are connected in this life. In meditation with this Blue Topaz Gemstone, Jane and I connected directly with the energy of the Great Mother in her aspect as the Goddess of the Starry Night Sky, depicted by Tarot Trump #17, The Star. Her color is brilliant super-clear electric blue, which resonates with the energy of Blue Topaz. 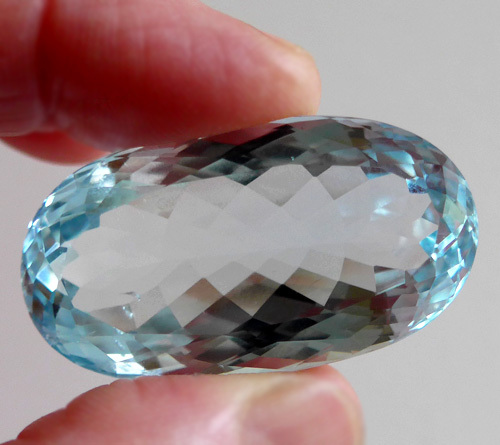 Best of all, the Blue Topaz triggered a meditation experience characterized by a feeling of being filled with the energy of the Star Goddess, which is electric blue, cool, heating, and soothing. Mental activity resolves into Silence and a felt sense of the peace which passeth understanding. Note: Weight above is shipping weight. Net weight 21.3 grams or 106.5 carats.